Animal Magic was established in 2009 by Laura Rennie, who has significant experience in the Animal industry having worked in a range of Zoological Keeping and Animal Education roles.ïµ² objective is to educate children and adults of all ages about animals, by providing an exciting, and memorable hands on experience. We pride ourselves in being very knowledgeable and professional but also quite informal and very adaptable. Always sensitive to our clients requirements, Animal Magic can cater for age ranges from 3 to 90, and has specially tailored workshops for clients with Special Needs . 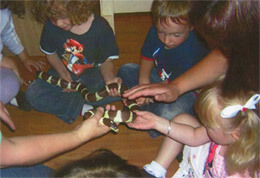 We hope that our safe, fun sessions promote a sense of achievement in our clients (it can be pretty scary meeting a snake!) and that it raises awareness towards animal care & conservation, ultimately encouraging people to be more caring to their environment and the animals who share it.